I wrote a couple of weeks ago about how New York is committing slow-motion fiscal suicide. The politicians in Illinois must have noticed because they now want (another “hold my beer” moment?) to accelerate the already-happening collapse of their state. The new governor, J.B. Pritzker, wants to undo the state’s 4.95 percent flat tax, which is the only decent feature of the Illinois tax system. And he has a plan to impose a so-called progressive tax with a top rate of 7.95. Here are some excerpts from the Chicago Tribune‘s report., starting with the actual plan. Democratic Gov. J.B. Pritzker embarked on a new and potentially bruising political campaign Thursday by seeking to win public approval of a graduated-rate income tax that he contended would raise $3.4 billion by increasing taxes for the wealthy… for his long-discussed plan to replace the state’s constitutionally mandated flat-rate income tax. 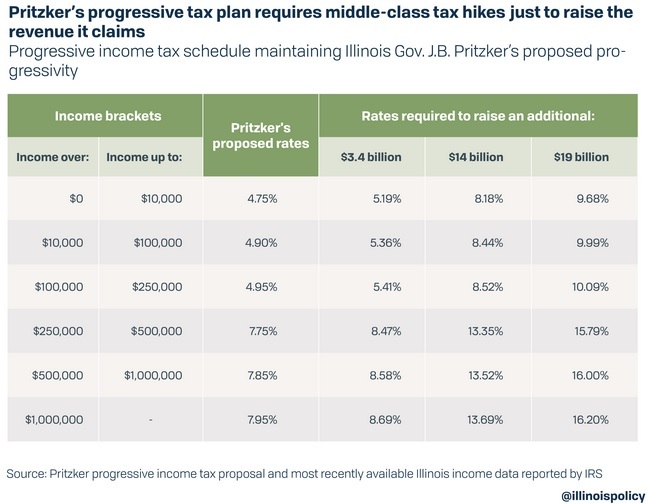 Currently, all Illinois residents are taxed at 4.95 percent… Pritzker’s proposal is largely reliant on raising taxes significantly on residents making more than $250,000 a year, with those earning $1 million and up taxed at 7.95 percent of their total income. …The corporate tax rate would increase from the current 7 percent to 7.95 percent, matching the top personal rate. …The governor’s proposal would give Illinois the second-highest top marginal tax rate among its neighboring states. And here’s what would need to happen for the change to occur. Before Pritzker’s plan can be implemented, three-fifths majorities in each chamber of the legislature must approve a constitutional amendment doing away with the flat tax requirement. The measure would then require voter approval, which couldn’t happen until at least November 2020. …Democrats hold enough seats in both chambers of the legislature to approve the constitutional amendment without any GOP votes. Whether they’ll be willing to do so remains in question. Democratic leaders welcomed Pritzker’s proposal… voters in 2014 endorsed the idea by a wide margin in an advisory referendum. The sensible people on the Chicago Tribune‘s editorial board are not very impressed, to put it mildly. …how much will taxes increase under a rate structure Pritzker proposed? You might want to cover your eyes. About $3.4 billion annually… That extraction of dollars from taxpayers’ pockets would be in addition to roughly $5 billion raised annually in new revenue under the 2017 income tax hike. …How did Springfield’s collection of all that new money work out for state government and taxpayers? Here’s how: Illinois remains deeply in debt, continues to borrow to pay bills, faces an insurmountable unfunded pension liability and is losing taxpayers who are fed up with paying more. 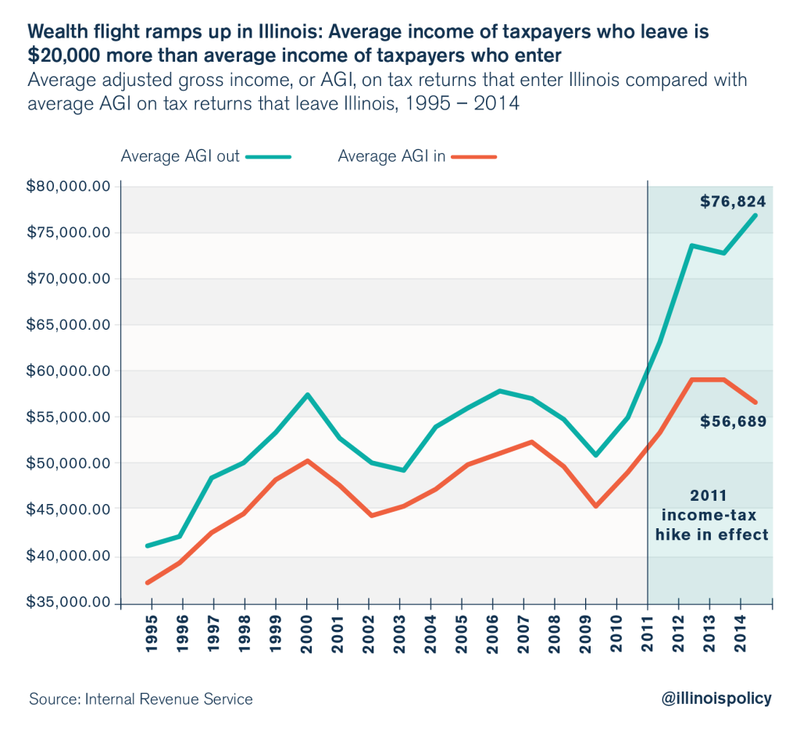 The flight of Illinoisans to other states is intensifying with 2018’s loss of 45,116 net residents, the worst of five years of consistent, dropping population. …Illinois needs to be adding more taxpayers and businesses, not subtracting them. When politicians raise taxes, they aren’t adding. A switch to a graduated tax would eliminate one of Illinois’ only fishing lures to attract taxpayers and jobs: its constitutionally protected flat income tax. …Pritzker’s proposal, like each tax hike before it, was introduced with no meaningful reform on the spending side of the ledger. This is all about collecting more money. …In fact, the tax hike would come amid promises of spending new billions. And here’s a quirk that is sure to backfire. For filers who report income of more than $1 million annually, the 7.95 percent rate would not be marginalized; meaning, it would be applied to every dollar, not just income of more than $1 million. Line up the Allied moving vans for business owners and other high-income families who’ve had a bellyful of one of America’s highest state and local tax burdens. The Tax Foundation analyzed this part of Pritzker’s plan. This creates a significant tax cliff, where a person making $1,000,000 pays $70,935 in taxes, while someone earning one dollar more pays $79,500, a difference of $8,565 on a single dollar of income. That’s quite a marginal tax rate. I suspect even French politicians (as well as Cam Newton) might agree that’s too high. 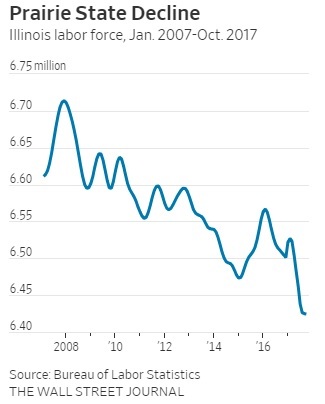 Though I’m sure that tax lawyers and accountants will applaud since they’ll doubtlessly get a lot of new business from taxpayers who want to avoid that cliff (assuming, of course, that some entrepreneurs, investors, and business owners actually decide to remain in Illinois). While the tax cliff is awful policy, it’s actually relatively minor compared to the importance of this table in the Tax Foundation report. It shows how the state’s already-low competitiveness ranking will dramatically decline if Pritzker’s class-warfare plan is adopted. The Illinois Policy Institute has also analyzed the plan. 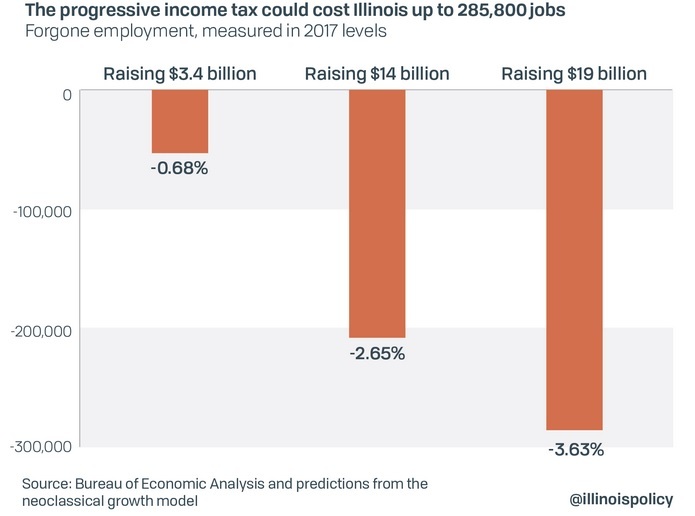 Unsurprisingly, there will be fewer jobs in the state, with the losses projected to reach catastrophic levels if the new tax scheme is adjusted to finance all of the Pritzker’s new spending. And when tax rates go up – and they will if states like Connecticut, New Jersey, and California are any indication – that will mean very bad news for middle class taxpayers. The governor is claiming they will be protected. But once the politicians get the power to tax one person at a higher rate, it’s just a matter of time before they tax everyone at higher rates. 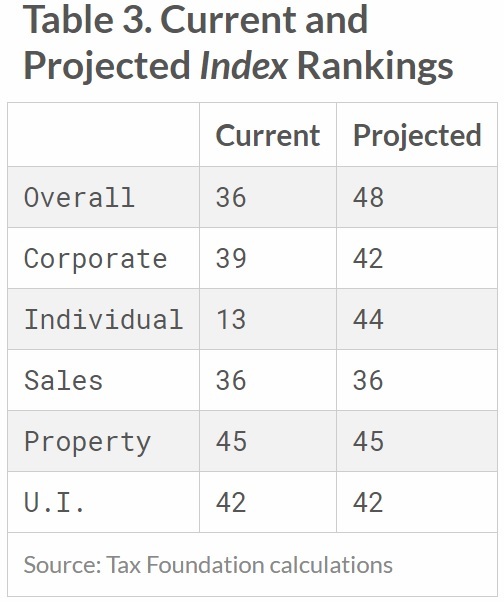 Here’s IPI’s look at projected tax rates based on three different scenarios. The bottom line is that the middle class will suffer most, thanks to fewer jobs and higher taxes. Rich taxpayer will be hurt as well, but they have the most escape options, whether they move out of the state or rely on tax avoidance strategies. Let’s close with a few observations about the state’s core problem of too much spending. Steve Cortes, writing for Real Clear Politics, outlines the problems in his home state. …one class of people has found a way to prosper: public employees. …over 94,000 total public employees and retirees in Illinois command $100,000+ salaries from taxpayers…former Chicago Mayor Richard M. Daley, who earned a $140,000 pension for his eight years of service in the Illinois legislature. …Such public-sector extravagance has fiscally transformed Illinois into America’s Greece – only without all the sunshine, ouzo, and amazing ruins. So nobody should be surprised to learn that the burden of state spending has been growing at an unsustainable rate. Indeed, over the past 20 years, state spending has ballooned from $34 billion to $86 billion according to the Census Bureau. At the risk of understatement, the politicians in Springfield have not been obeying my Golden Rule. And today’s miserable fiscal situation will get even worse in the near future since Illinois is ranked near the bottom when it comes to setting aside money for lavish bureaucrat pensions and other retirement goodies. Indeed, paying off the state’s energized bureaucrat lobby almost certainly is the main motive for Pritzker’s tax hike. As as happened in the past, this tax hike is designed to finance bigger government. Yet that tax hike won’t work. Massive out-migration already is wreaking havoc with the state’s finances. And if Pritzker gets his tax hike, the exodus will become even more dramatic. P.S. Keep in mind, incidentally, that all this bad news for Illinois will almost certainly become worse news thanks to the recent tax reform. Restricting the state and local tax deduction means a much smaller implicit federal subsidy for high-tax states. P.P.S. I created a poll last year and asked people which state will be the first to suffer a fiscal collapse. Illinois already has a big lead, and I won’t be surprised if that lead expands if Pritzker is able to kill the flat tax.